One word to summarize what happened Thursday: wow. All of the conferences except the ACC and Patriot League (who already finished their tournaments last week) and the Ivy League (who play Friday and Sunday) had their semifinals yesterday, and it brought some big results that will affect plenty of bubble teams. You read those scores right. Vermont upset Stony Brook, and Hartford upset Albany to steal a bid from a possible bubble team. We all thought it would be Stony Brook and Albany, but that’s why you play the games! In the first game, Cam Milligan, Ian MacKay, and Jack Knight each had two goals and an assist, with Milligan scoring the game winner with 3:26 left in the game. Goalie Jon Kaplan made 17 saves on the afternoon to lead the underrated Catamounts to their first ever program win over Stony Brook. Challen Rogers had two goals and an assist to lead the Seawolves in scoring, while Zach Oliveri was also strong in the crease with nine saves. In the second game, Justin Huggins scored five goals, including the game-winner in overtime, and dished out two assists, while FOGO Dylan Protesto went 20-of-24 from the faceoff X to give the Hartford Hawks the 11-10 win over #4 Albany. Griffin Feiner had a four goal night, while Ryan Vanderford stopped 13 shots against Albany’s high-powered offense. Connor Fields had a hat trick, but Seth Oakes was held to only an assist. Blaze Riorden also stopped 13 shots. Are Albany’s chances of hosting a First Round game toast? Hartford and Vermont play in the AE Championship on Saturday at 10 am on ESPNU. The Terps opened up their game with a 6-0 run to eventually beat the Nittany Lions 16-9 in the first of two Big Ten semifinals at Homewood Field. Connor Kelly had a four goal night, while Matt Rambo and Colin Heacock each scored hat tricks. Pat Young also contributed to the balanced Maryland offense with two goals of his own. Kyle Bernlohr made 12 stops, but the Terps lost the faceoff battle 17-12, as they’re still without the services of Austin Henningsen. Nick Aponte scored four times for Penn State and Will Schreiner made eight stops. In the second game, the designated home team Rutgers pulled away late from the designated road team Johns Hopkins to win 14-12 to keep their bubble hopes alive. 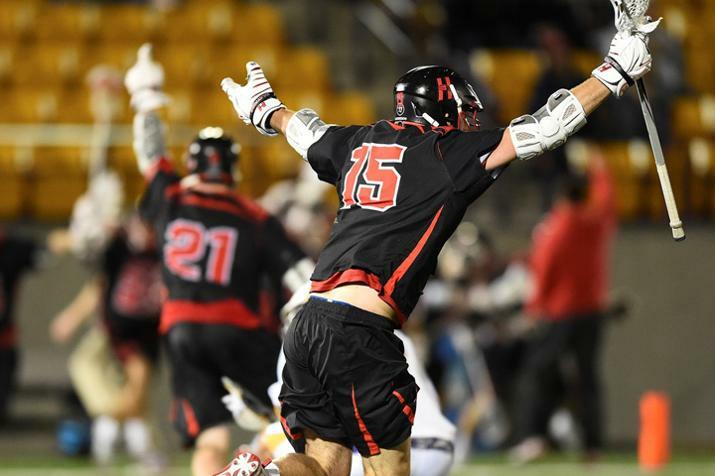 The Scarlet Knights had 12 different players record points, led by freshman sensation Adam Charalambides and his five goals. Scott Bieda dished out three assists, and Casey Rose had a hat trick, while goaltender Kris Alleyne made 14 stops. For the Blue Jays, Ryan Brown scored five times and recorded two assists, while Shack Stanwick had two goals and two assists. Johns Hopkins was in contention for the final seed in the NCAA Tournament. There’s a good chance that they’ll be an unseeded team once again when they find out on Selection Sunday. Meanwhile, Rutgers and Maryland square off Saturday night at 6 pm in the Big Ten Championship on ESPN2. Marquette pretty much ended Villanova’s hopes of getting an at-large bid with a wire-to-wire 14-9 win over the Wildcats in Denver. Ryan McNamara scored four goals, while Kyle Whitlow had a hat trick, and Cole Blazer made 10 stops. Compared to Nova’s goaltenders of Nick Testa and Dan Willis, they made a combined four saves. In the other semifinal, Zach Miller, Jack Bobzien, and Connor Cannizzaro all recorded at least five points in Denver’s 17-8 win over Providence. Tate Boyce made 12 stops and Will Mazzone scored a hat trick for the Friars. Marquette and Denver will duel it out on Saturday in the Big East Championship at 4:30 pm on Fox Sports 2. The Tigers scored five times in the opening quarter, including a last second shot that went off of Drexel goalie Jimmy Joe Granito’s glove, to defeat the Dragons 10-6. Towson had nine different goal scorers, with Joe Seider being the only Towson player to score multiple goals. Jacob O’Donnell scored twice for Drexel, while both Granito and Towson goalie Tyler White made nine stops. In the second semifinal, the CAA Rookie of the Year and Co-Player of the Year Colin Burke had five goals and two assists, while TJ Neubauer netted a hat trick to lead the Stags to an 11-8 win over the Pride. Tyler Behring made 14 stops for Fairfield. Sam Llinares had a goal and three assists, while Korey Hendrickson had two goals in their final collegiate games. Fairfield and Towson will duel it out Saturday afternoon at 1 pm in the CAA Championship on CAA.tv. Kevin Forster’s five goals and Hayes McGinley’s hat trick spearheaded a second half comeback to help the Hawks defeat Robert Morris 14-7. Meanwhile, Hobart erased the memory of getting trounced by Bryant 15-2 two weeks ago to upset the Bulldogs 7-6. Frank Brown led the Statesmen with a hat trick, while goaltender Jackson Brown made nine stops. Hobart and St. Joe’s will play in the NEC Championship game Saturday at 1 pm on NEC Front Row. The Bobcats used runs of 6-1 and 4-0 to take care of the Golden Griffins 13-7. Ryan Keenan had five goals, while Foster Cuomo had four of his own. Jack Brust made 18 stops in the cage for the win. In the second semifinal, Thomas Rago’s game-winner with 9.3 seconds left gave Marist the 8-7 win over Monmouth. Joseph Radin had a hat trick, and Brian Corrigan made nine stops. Marist and Quinnipiac will play in the MAAC Championship game for the second straight year on Saturday at noon on MAAC.tv (you’ll need to pay to watch). Chris Walsch’s hat trick and two assists was just enough to give the Falcons a 10-8 win over the Knights from Bellarmine. Doug Gouchoe made seven stops in the win. In the second semifinal, Teddy Hatfield had six goals, and JP Forester had three goals to give the Spiders a 17-6 blowout win over High Point. Richmond and Air Force will play for the SoCon Championship Saturday at noon on ESPN3.com. Winners: Rutgers is one of them. A loss would have muddled their chances of an at-large bid with the chaos known in the AE. Marquette is another team that helped their chances with a win over fellow bubble Villanova. Syracuse is also a winner with Albany and Hopkins losing. That increases their chances of hosting a game next week. Losers: There’s a ton of them, and you can thank the America East! Starting with the AE, Albany’s chances of hosting a game dropped, and Stony Brook had their bubble popped last night. So with Vermont or Hartford stealing a bid, teams like Navy, North Carolina, and maybe Villanova and Penn State are going to have to sweat it out on Selection Sunday. Other losers include Bryant, who’s at-large resume is probably toast, and Johns Hopkins, who will probably not host a home game in the First Round. Will we see more chaos in the Ivy League semifinals tonight? Who knows.